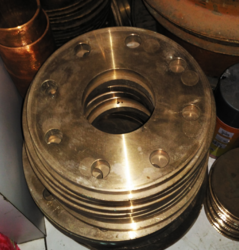 Manufacturer of a wide range of products which include cupro nickel flanges, copper nickel pipe fittings, cupro nickel pipe, copper nickel rod, copper nickel plate and copper nickel sheet. Inox Steel India Is Importer And Stockist Of Cupro-nickle Pipe Fittings . Copper-nickel (also Known As Cupronickel) Alloys Are Widely Used For Marine Applications Due To Their Excellent Resistance To Seawater Corrosion, Low Macrofouling Rates, And Good Fabricability. APPLICATION : Marine: Guidelines for Seawater System Design and Operation are presented; Seawater System Components are detailed; Sections cover Cu-Ni in Desalination Plants, Offshore Oil and Gas, Power Generation, Shipbuilding and Ship Repair, Boat Hulls, and Marine Antimicrobial applications. Inox Steel India Is Importer And Stockist Of Cupro Nickel Pipe/Cupro Nickel Tube.Copper-nickel (also Known As Copper Nickel) Alloys Are Widely Used For Marine. Application : Marine: Guidelines For Seawater System Design And Operation Are Presented; Seawater System Components Are Detailed; Sections Cover Cu-ni In Desalination Plants, Offshore Oil And Gas, Power Generation, Shipbuilding And Ship Repair, Boat Hulls, And Marine Antimicrobial Applications.Non-marine: Coinage; Brake Tubing. Size:- Available in ¼ “ to 12 ¾ “ diameter from stock . Length as specified by client . Size : Thickness between 3/16 “ and 2 ½ “ from stock . Width: 8 “ width and length as per client requirement . • Thickness between 0.63 “ and 3/16 “ from stock. • Width and Length as per specified by customer.